by Sister Pat Davis O.P. Over the centuries the native peoples of America had developed societies which were based on delicate balances among the tribes and with their natural setting. Their pace of life, their boundaries, and their means of livelihood corresponded with nature. Over the ages various tribes along the water routes, now called the St. Lawrence Seaway and the Great Lakes, confederated into "nations": the Algonquin tribes north of the St. Lawrence, the Huron peoples north of the lake bearing their name, and the Iroquois confederation south of the Great Lakes. They lived in longhouses (long wooden dwellings used as communal homes or council halls by some tribes) in the cold winters and traveled to fishing and hunting grounds in birchbark canoes during the summer. Their life was demanding, but prudent with the wisdom of long experience. The French explorers came to Canada with a little less greed and with a more respectful attitude than did some other conquerors. Perhaps it was because there was no gold for the greedy or perhaps because the long winters of New France required companionship. Or they may have realized that the Hurons and Algonquins; were, like themselves, created by God. Some Frenchmen came to search the waterways for a route to the Pacific Ocean and the Far East. Some came to trade for the sleek pelts of the beaver, popular in the manufacture of European top hats. But also daring the two month Atlantic journey came the Jesuit priests, dressed in their black robes, who were trading their French education and homeland for a chance to share with the native Americans what was most dear to them - their faith, their belief in God's love. They came with full knowledge that they would likely suffer and die for the truths they held most dear .... And they were not wrong. These men became the group we now venerate as our North American martyrs. Their martyrdoms were most severe. Their lives contain the "stuff" of legends, and due to the Jesuit insistence on record keeping, we can read in their own words what they hoped and endured as they landed in a world absolutely alien to that of their homeland. Traditionally, one of these saints, St. Isaac Jogues, has been claimed by the Catholic church of the United States because he was martyred in what was later to become the state of New York. In 1636 Pere Isaac Jogues, newly ordained and 29 years old, joined the small band of Jesuits at Three Rivers (Irois Rivieres), a tiny French trading post on the St. Lawrence River. He arrived with the small Mass kit that his mother had given him. He also arrived with the hope that the Hurons, who were completing their summer's trading, would allow him to travel hundreds of miles inland with them when they returned home. To strengthen French-Huron friendship, the French authorities convinced the Hurons to exchange children for the year. So it was that 10-year-old French orphan boy Jean Amyot and Fr. Jogues traded places in the birchbark canoes with three Huron youths for the return trip to the Huron villages. For weeks the two newcomers squatted shoeless and motionless in the fragile canoes as they followed the St. Lawrence and Ottawa Rivers westward. The Jesuits at Three Rivers had told Fr. Jogues to be of as much use as possible, so he helped gather wood for their evening meal and helped portage the canoes and supplies when they came to dangerous rapids or to the land they must cross between waterways. Jean and Isaac began to grow accustomed to the Hurons' habits and to the sound of their language, and learned of necessity to eat the native food. 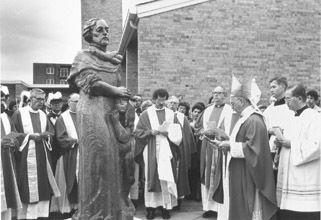 Pere Jean de Brebeuf, who had been the first "Blackrobe" to reach the Hurons a few years before and who would later be martyred and canonized, greeted Isaac when he reached the Huron village near the present location of Midland, Ontario. Fr. Jogues' arrival brought the Blackrobes' total to five, three recently arrived. Fr. Brebeuf began sharing his several years of experience with the newer missionaries. "We can only progress slowly and count on God's ways," he cautioned the newcomers. He had baptized few Hurons in the years he had been there, most as they lay dying. He recognized that even the little trust he had painstakingly cultivated was due to the Hurons' distress in times of famine and illness. But he felt the priests must continue to be constantly attentive to the ways and needs of the Hurons. Only God would know if they made progress. The Hurons were traditionally friendly to all strangers. The Blackrobes felt free to move in and out of the longhouses of the villages and knew the Indians would share what they had with them. The Hurons felt equally free to sit near the fire in the Blackrobes' lodge, to partake of their meals, and to talk to them of their beliefs. Sometimes they would wait for hours to hear the clock chime over and over, mystified, and convinced that a spirit within it was speaking to the priests. Some Hurons guessed, and rightly so, that the arrival of the Blackrobes was a mixed blessing. It seemed that illness and death, thought by the Hurons be caused by angry spirits, came with the Frenchmen. Fr. Jogues was sick with influenza his first winter with the Hurons and it spread to several other Frenchmen. They recuperated slowly, only to help the Hurons who had no resistance to this white man's disease and who often died. The epidemic spread from village to village. Fr. Jogues was blamed and some Hurons wanted him to leave. Only by sincere service could the missionaries counteract these judgments. As summer arrived, the epidemic lessened, and fishing, hunting, and the annual trading trip were more in mind. As Fr. Jogues learned the ways and language of the Hurons he became more acceptable. The Iroquois confederation of tribes south of the Great Lakes was the traditional enemy of the Huron people. Dutch traders had provided these Indians with muskets, while at that time the French did not provide Algonquins or Hurons with guns. With weapons the Iroquois became invincible and daring, finally able to destroy their long-time enemies north of the lakes. As a result the Hurons were vengeful toward any Iroquois whom luck delivered to them. They killed their prisoners painfully, as they knew the Iroquois did Huron captives. It was soon after his arrival that Isaac witnessed these gruesome proceedings in which the Indians did not distinguish between killing an enemy in defense and taking vengeance after the battle. Centuries of tribal customs dictated against Christian insights and the time of true Christian conversion seemed far distant to the missionaries. When the yearly reports that traveled east by canoe and ship reached France, the missionaries admitted to no conversions among the Hurons - until a surprising thing happened. in the way of the Blackrobes. Their way of life made a marked contrast to that of their tribesmen. Becoming a Christian was a radical decision but, once they took the step, they were as unflinching in their faith as their Huron training had required in every other aspect of their lives. Eventually many Hurons would be Christian martyrs. In the summer of 1642, the Hurons decided to forego their annual trading trip to Three Rivers since Iroquois war parties were infiltrating the area. The missionaries, knowing that a lack of medicine and supplies would cause much suffering, decided to make the trip alone. Fr. Jogues offered to go and some Christian Hurons and French laymen offered to accompany him. The four canoes made it safely to Three Rivers where a young French doctor joined them for the return trip with the year's supplies. On their return, the group was attacked and captured by Mohawks, members of the Iroquois nation. They were paraded through many villages and constantly tortured as their captors traveled south to Ossernenon, their village in upstate New York near present day Auriesville, not far from Albany. They finally arrived at Ossernenon with open wounds and broken bones. Fr. Jogues encouraged the captives to forgive their captors and offer their sufferings to God on their behalf. An Algonquin captive was forced to cut off Fr. Jogues' thumb to assure the Mohawks that the missionary would never use weapons against them. Several of the captives were killed. The young French doctor asked Fr. Jogues if he might vow his life to God as a Jesuit since only his health had deterred him from joining the Society earlier. He did so and was soon killed, thus becoming the first North American Jesuit martyr. For some reason the Mohawks were saving Fr. Jogues, perhaps as protection against reprisal from the French. He ended up in the service of a respected old Mohawk woman who preserved his life more thanonce and even called him "nephew." Once, while he acted as his "aunt's" porter to a Dutch town, the men of the town offered to help Fr. Jogues escape. At first he refused since he was learning the ways and language of the Mohawk people and felt he might even be able to share his beliefs with them. But eventually, when he had managed to send a warning note to Quebec about a Mohawk attack, he knew he must escape the wrath of his captors. His first escape attempt was thwarted by some barking dogs but he managed to get free with A. daring second attempt. A kindly Dutch ship's captain returned Fr. Jogues to France on Christmas Day, 1643, and he was able that day to receive communion for the first time in seventeen months. When Fr. Jogues reached the Jesuits, his appearance was so changed that at first he wasn't recognized; but he soon found that all of France had been following his ordeal through reports sent back by way of French and Dutch ships. Even the queen requested his presence. During this age of specific liturgical requirements, the Pope gave Fr. Jogues permission to use his remaining fingers to hold the consecrated host at Mass. Fr. Jogues spoke with love of his former persecutors, telling how his Mohawk aunt had protected him. Since he now knew their language and customs, he felt God had suited him well to return to the native Americans. In time, Fr. Jogues' superiors agreed. 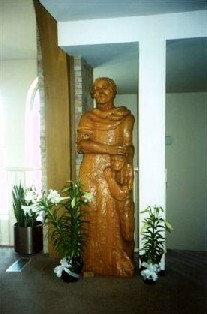 The statue is made of white oak strips that were glued together. The collar around his neck is the top of his Jesuit cassock. Three ropes appear around his neck: twice captured by the Indians, once by Christ. Over his shoulders is an Indian blanket, torn off on the left shoulder to represent the rough treatment he received while a prisoner. More of the blanket can be seen on his back. His fingers on both hands are mangled. This was part of the torture he underwent for his faith. He holds the Indian child close to him as a protective father would. Notice in the back how the child's arm is wrapped around him. 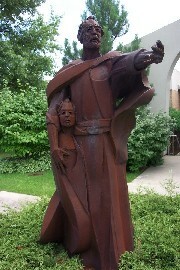 I will not describe neither the face of St. Isaac Jogues; nor the Indian child's. I think that each of us will have our own feelings on that. My heart tells me that if I am the one to be sent on this mission I shall go but I shall not return. But I would be glad if our Lord wished to complete the sacrifice where He began it. Farewell, dear Father. Pray that God unite me to Himself inseparably. Fr. Jogues returned to his aunt's longhouse but could tell she was concerned for him once again. A long summer's drought was believed to have been caused by evil spirits in his Mass kit. Also, the younger braves were irritated by their elders' moves towards peace and knew that Fr. Jogues had encouraged the exchange of prisoners. While the elders were in council, a young Mohawk asked Fr. Jogues and a Jesuit lay volunteer who had come with him to come speak to the young braves in his lodge. Both "Auntie" and Fr. Jogues knew that he would have no security outside her longhouse, yet, to refuse the invitation would be unthinkable. Fr. Jogues went, and, as he entered the lodge of the young man, he was killed. He died in October of 1646, ten years after first arriving in the New World. The Jesuit lay helper was killed as well. As remarkable as Fr. 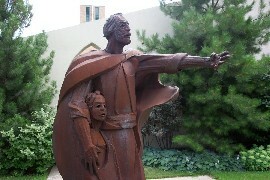 Jogues' story is, there is another that follows it. During the autumn of the year following Fr. Jogues' death, the orphan boy who had accompanied him eleven years previously was with some Frenchmen who were attacked by a dozen Mohawks. The French killed eleven attackers and captured one who was then taken to Three Rivers. Eventually, the captive Mohawk bragged that he had been the one to kill Fr. Jogues. The Algonquins and Hurons were furious and planned revenge on the man, but the Jesuits protected Fr. Jogues' murderer. After some weeks in their care, the Mohawk asked the Jesuits for baptism, relating the knowledge he had gained from Fr. Jogues at Auntie's fireside in Ossernenon. He asked to take Isaac Jogues' name and so was baptized. A week later, Algonguins dragged the Mohawk from the Blackrobe's care and killed him. One of the priests later reported, "God willing, there are now two Isaac Jogueses in heaven." This article is excerpted from an unpublished manuscript entitled "Our Saints, Our Story," by Sister Pat Davis, O.P., and is printed with permission. Sister Pat Davis, 0. P., a Sinsinawa Dominican, got hooked on saints in third grade from the -stories in her readers. Her curiosity about these Christian heroes eventually developed into a master's project on the American saints. She currently works as a Director of Religious Education in Peoria, Illinois. Copyright 1987, J.S. Paluch Company, Inc. from The WORD in the HOME, Vol. 12, No. 10. Used with permission.